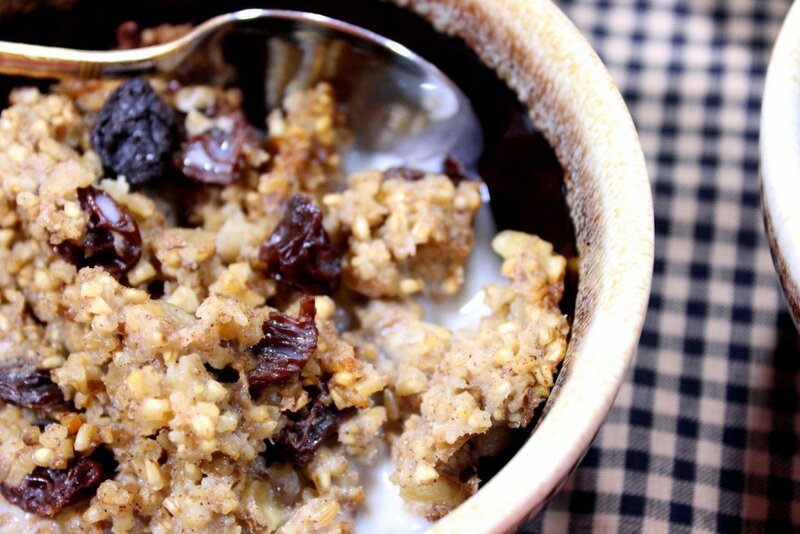 Baked Steel Cut Oatmeal with Banana, Walnuts, and Raisins is a gluten-free, flavorful, and hearty breakfast that will stick with you all morning long and give you the energy you need to tackle your busy day! 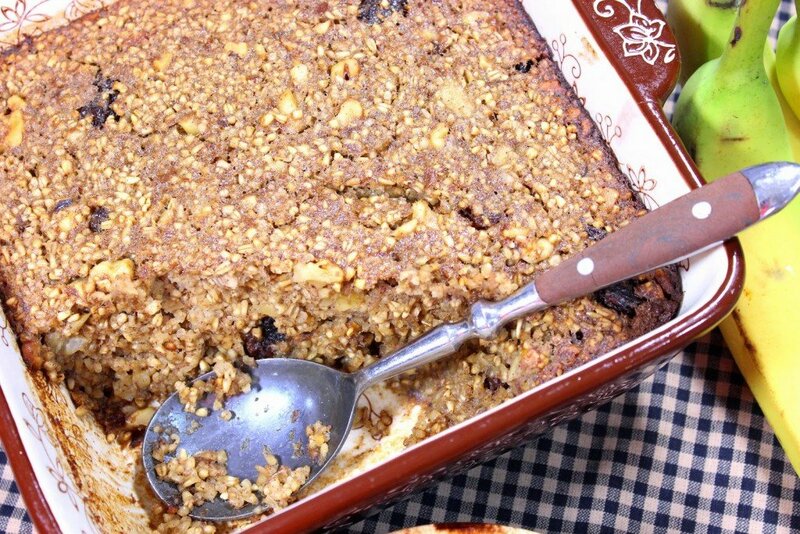 Dear readers, this baked steel cut oatmeal is an updated article from one I originally published back in January of 2015. The recipe and photos remain the same, but the nutrition information and the printable recipe card feature are new. 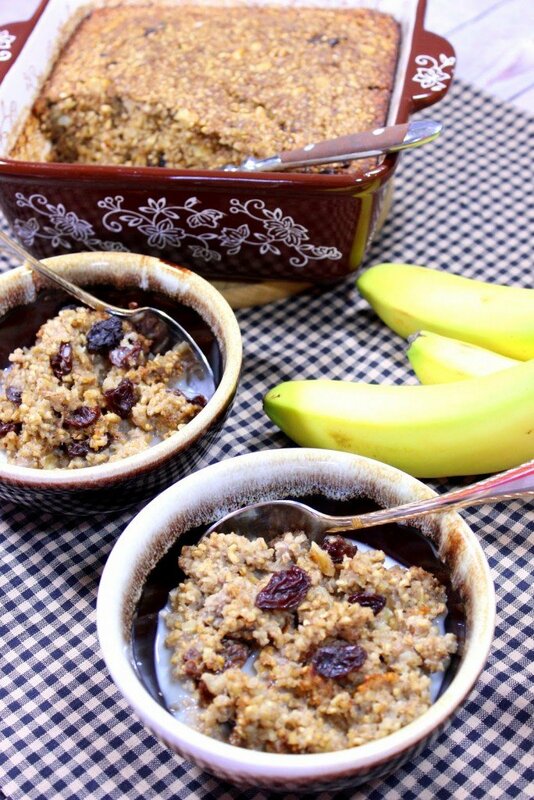 **Please Note – The printable recipe card with detailed instructions, complete ingredient measurements, and nutritional information for making Baked Steel Cut Oats with Banana, Walnuts, and Raisins is available near the end of this post. When I saw Cookin Canuck‘s recipe for Baked Steel Cut Oatmeal with Tart Cherries and Pepitas, I knew in a flash I had to make it. I even tweeted Dara (or was it a Facebook comment?) telling her how good it looked, and that I’d printed it and put it on my list to make ASAP. A mere few days later had me whipping up Dara’s baked steel cut oatmeal in my Kudos Kitchen but naturally, I needed to put my spin on it to make it my own. Since I had walnuts in my freezer, bananas on my counter, and raisins in my pantry, I ran with it and made this Baked Steel Cut Oatmeal recipe with bananas, walnuts, and raisins, and I’m including a wink and a nod to Dara. Steel cut oats are much higher in fiber than rolled or quick oats which makes them better for eliminating waste from the body. They have a low glycemic index which helps to minimize spikes in blood sugar levels. Steel cut oats are a good source of iron. Iron is a component of hemoglobin which travels through the bloodstream and helps deliver oxygen to the body’s organs and tissues. The texture of this baked steel cut oatmeal is truly incredible. I love the heartiness that each spoonful transports to my waiting taste buds and hungry tummy knowing that both will be happy, and satisfied! Plus, as a bonus, there will be no more of that pesky growling and grumbling from my stomach until lunchtime. I like to pour additional almond milk over the top of my baked steel cut oats before serving, along with a sprinkling of extra raisins, but you be the judge as to how you’re going to serve yours. If you’re not serving a large family why not plan on making this steel cut oatmeal recipe early in the week (on or the weekend) and then you’ll have an easy no-fuss breakfast all week long. Mix the oats, baking powder, salt, cinnamon and nutmeg in a large bowl. In a medium bowl, mix together the mashed banana, almond milk, agave, coconut oil, egg, and extracts. 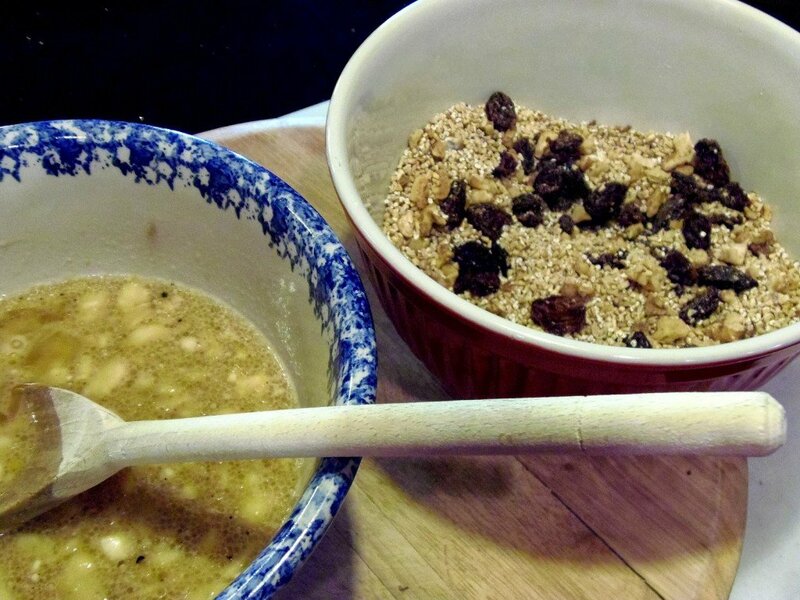 Add the walnuts and raisins in with the dry ingredients. Stir the almond milk mixture into the dry ingredients and stir well to combine. 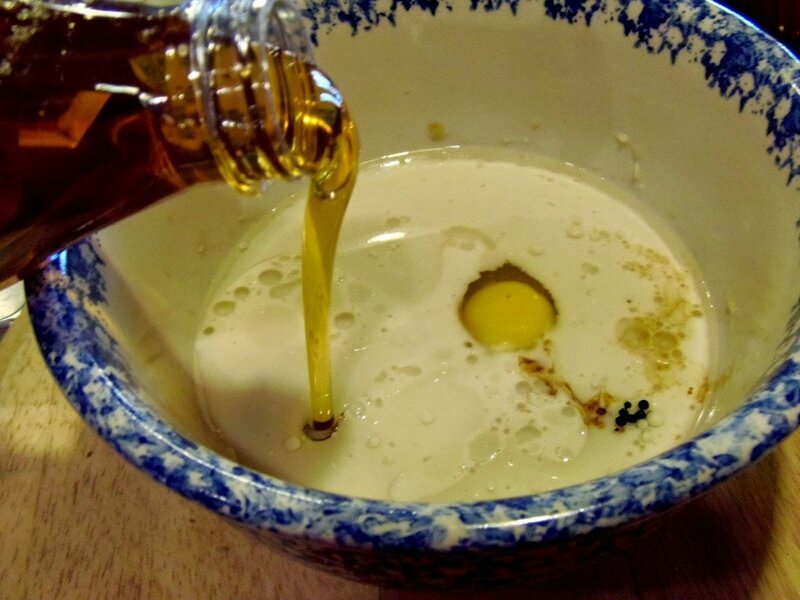 Pour the mixture into an 8″x8″ baking dish that has been sprayed with baking spray and bake until set and golden. Cool the oatmeal slightly and then spoon into bowls and serve as desired. 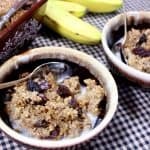 **The following affiliate links are some suggested products I’ve chosen that will aid you in the making and serving of this recipe for Healthy Baked Steel Cut Oatmeal with Banana, Walnuts, and Raisins if desired. Below is the printable recipe card for today’s Baked Steel Cut Oatmeal. If you’ve enjoyed this recipe and look forward to making it (or have already made it), I’d appreciate if you’d take a moment to give it some feedback by way of stars near the comment section at the end of this post. Thank you so much! 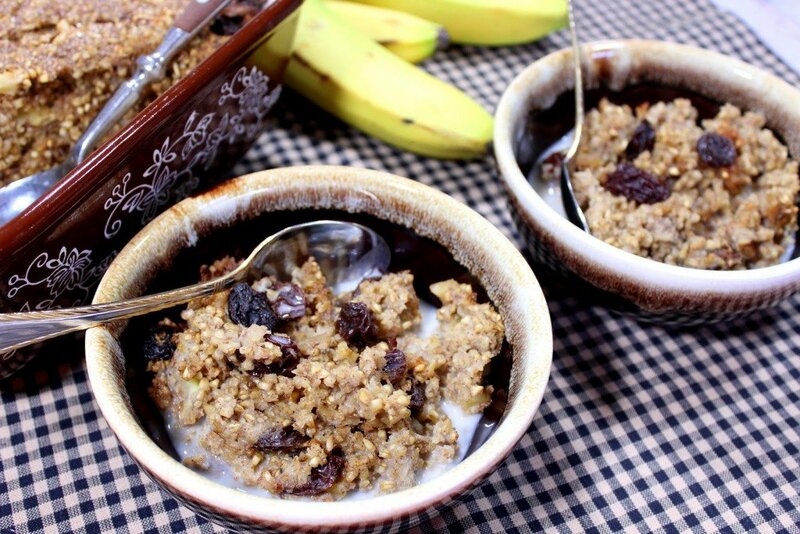 Baked Steel Cut Oatmeal with Banana, Walnuts, and Raisins is a flavorful and hearty breakfast that will stick with you all morning long and give you the energy you need to tackle your busy day! 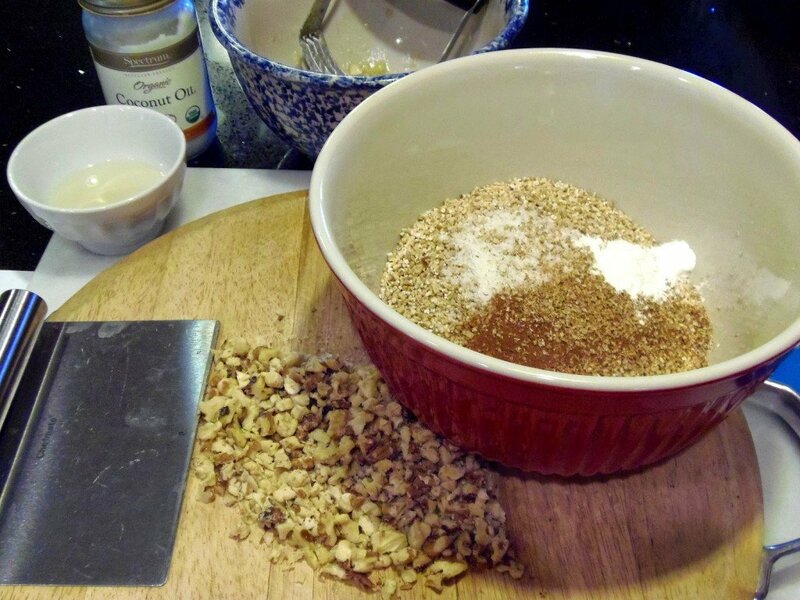 In a large bowl, stir together the oats, baking powder, salt, cinnamon, and nutmeg. Add in the raisins and walnuts. Stir to combine. Set aside. In a medium bowl, whisk together the almond milk, agave, melted coconut oil, maple extract, vanilla extract, egg, and bananas. 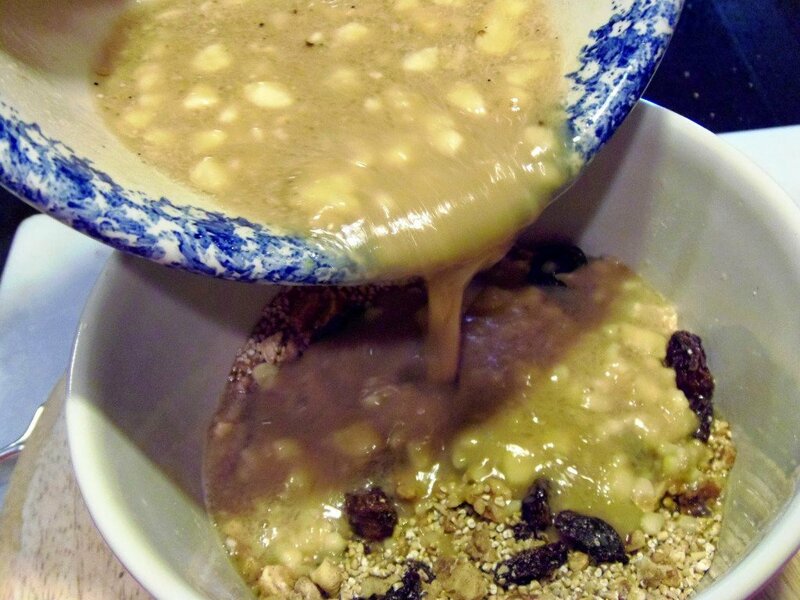 Pour the almond milk mixture into the oat mixture and stir well to combine. Pour the mixture into an 8x8 baking dish that has been sprayed with baking spray. Bake in a preheated oven until the oatmeal golden brown and set in the middle (about 60 minutes). 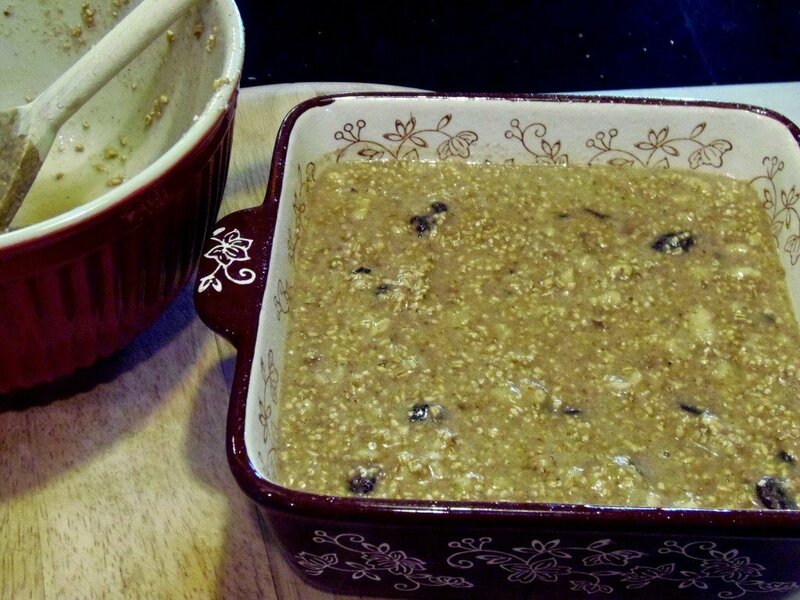 Allow to cool slightly and then spoon oatmeal into bowls and serve as desired. Chef's knife (or nut chopper), forks or pastry blender for mashing bananas, bowls, measuring spoons, measuring cups, baking spray, 8" x 8" baking pan, whisk, wooden spoon, spatula, toothpick or cake tester. 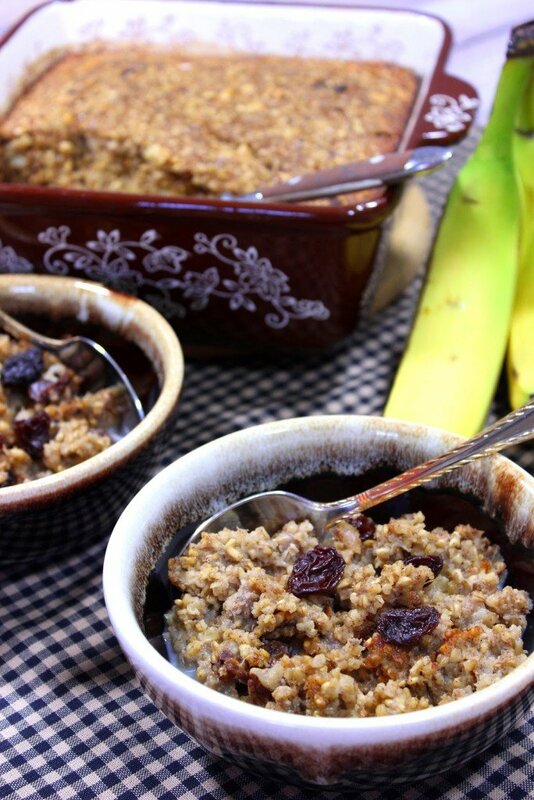 Warm from the oven, this is one tasty and nutritious whole grain breakfast of Baked Steel Cut Oats is one you’ll feel good about feeding your family! I sincerely hope you’ve enjoyed today’s steel cut oat oatmeal recipe as much as I’ve enjoyed bringing it to you! 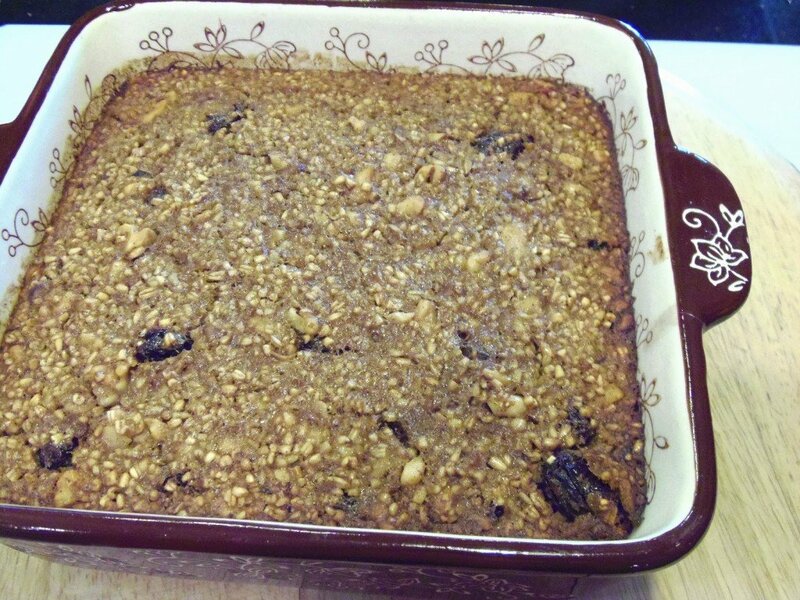 I'm not a huge fan of raisins, but I'd gobble this up made with tart cherries! What a great breakfast! I remember admiring Dara's recipe – and now your version looks equally good! Love the idea of having breakfast already made for the week too! These are exactly the kinds of flavors I like in my oats. You either love or hate the heartiness of steel cut oats. It's much more filling and hefty than regular rolled oats but I love it just as much! Looks yummy! I swear, baked oatmeal has been on my to-try list FOREVER! I need to get on it, because this sounds amazing (and I said the same to Dara – ha!). Awesome combo. Why have I never made steel cut oatmeal before? Time to correct that, your recipe looks so gorgeous and delicious! What a great combination of flavors! I need to make this now! I just started to enjoy oatmeal (bit late to the game) and it's all about the steel cut. Now to try this baked version! I love the idea of baked steel oats! This one is a keeper. This is so satisfying and comforting! 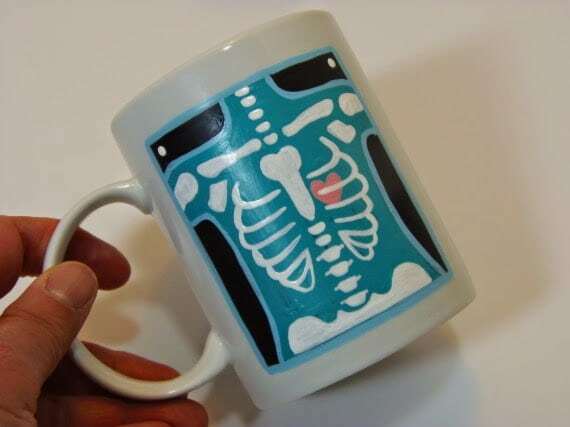 Perfect on the cold mornings we’ve been having! You are so right, Wilhelmina!! Thank you!